Did a shadow fall across the moon or did the moon simply go out, extinguished as abruptly and completely as a candle? There was still the sound of leaves, a terrified, terrifying rushing. All light was gone. Darkness was complete. Suddenly the wind was gone, and all sound. Meg felt that Calvin was being torn from her. When she reached for him her fingers touched nothing. She screamed out, “Charles!” and whether it was to help him or for him to help her, she did not know. The word was flung back down her throat and she choked on it. She had lost the protection of Calvin’s hand. Charles was nowhere, either to save or to turn to. She was alone in a fragment of nothingness. No light, no sound, no feeling. Where was her body? She tried to move in her panic, but there was nothing to move. Just as light and sound had vanished, she was gone, too. The corporeal Meg simply was not. This is another one of those cases where the text is not overtly misogynist, but it still ends up kinda being that way by accident? I mean, I would scream if strange women teleported out of thin air and storm whipped up for no reason and I got teleported myself without any kind of warning or pause for my consent. But we never see Calvin scream (he can't, being the emotional anchor to Meg) or Charles scream (he won't, being smart enough to understand what is happening), so this is a case where having more marginalized people would have fixed the FedEx arrow. In short: Calvin and/or Charles should be girls. Then we would have Sisters and Lesbians. Ah well, maybe next time. There's a lot of stuff about Meg being lost in a dark void that is emptiness and nothingness and there aren't even any vibrations ("This was more than silence. A deaf person can feel vibrations.") and then her heart starts beating again which disorients her because she can't work out how she can be alive if it had stopped and so forth. Or paused for consent! A warning is great but permission is better! I realize that it's standard fare for alien creatures to just do mysterious things to humans in literature because it's generally more interesting for the reader to read the shocking-and-scary thing first and then get the long boring explanation of the thing. I do get it. But it's important to understand that this does affect the characterization of the alien creatures as being kinda assholes about obtaining consent before doing things to people. One way to get around this is urgency ("quick, someone's coming!") or uninformed consent ("let's tesser!" "er, okay? wait no ohmygod I take it baaaaaack") but here we went for just yank-and-go and I must say I think that's a wee bit lazy as an author. Yes, it's harder to write the consent in and keep the drama, but good art is effort. Okay, that's my soapbox for the day. Let's just put it away now. She saw Charles, she heard him, but she could not go to him. She could not shove through the strange, trembling light to meet him. Meg gasped. It wasn’t that Calvin wasn’t there and then that he was. It wasn’t that part of him came first and then the rest of him followed, like a hand and then an arm, an eye and then a nose. It was a sort of shimmering, a looking at Calvin through water, through smoke, through fire, and then there he was, solid and reassuring. “I’m right here,” she tried to say, but her voice seemed to be caught at its source. “Meg!” Calvin cried, and he turned around, looking about wildly. “Mrs Which, you haven’t left Meg behind, have you?” Charles Wallace shouted. “If you’ve hurt Meg, any of you—” Calvin started, but suddenly Meg felt a violent push and a shattering as though she had been thrust through a wall of glass. “Oh, there you are!” Charles Wallace said, and rushed over to her and hugged her. I'm not sure if it is ever explained why Meg takes more time to pass through than Charles and Calvin. As it is, the event slips into the pattern we already have where Charles is the best, Calvin is a close second, and Meg is kind of the straggling ugly ducking bringing up the rear (but still trailed by the merely-pretty and genuinely-stupid people). Anyway. Meg is fairly chill about what just happened and asks where they are and we get a nice landscape pan. They were standing in a sunlit field, and the air about them was moving with the delicious fragrance that comes only on the rarest of spring days when the sun’s touch is gentle and the apple blossoms are just beginning to unfold. She pushed her glasses up on her nose to reassure herself that what she was seeing was real. They had left the silver glint of a biting autumn evening; and now around them everything was golden with light. The grasses of the field were a tender new green, and scattered about were tiny, multicolored flowers. Meg turned slowly to face a mountain reaching so high into the sky that its peak was lost in a crown of puffy white clouds. From the trees at the base of the mountain came a sudden singing of birds. There was an air of such ineffable peace and joy all around her that her heart’s wild thumping slowed. This is important for theological reasons, so I have to leave the scifi over here and walk over to put on my theology hat. This place is paradise in a scifi way, like all the pretty paradisaical settings people stumble onto in Star Trek. But it is also paradise in a religious way. This place is free of sin, which is important because we're about to get a lesson in original sin as played out on a cosmic scale. When people first started theorizing there might be life on other planets, Christians had to figure out what to do with this idea. Many Christians believe Jesus is the only way to heaven, but this doesn't scale up well--surely people on Jupiter shouldn't go to hell for failing to worship a guy on Earth! On solution was that each planet would have their own Jesus--though he would need to be the same Jesus, in a metaphysical sense, for Christians to be right about Jesus being the only way to heaven ("I am the way and the truth and the life. No one comes to the Father except through me."). This is why Lewis was so adamant that Aslan was actual-Jesus and not a metaphorical-Jesus. But would every planet need Jesus? Once we started thinking about life on other planets, we had to think about how that life started and whether original sin came into the picture. Some Christians fancied the idea that every planet with life had their own Adam and Eve, and that each of those A&Es had the same opportunities ours had. 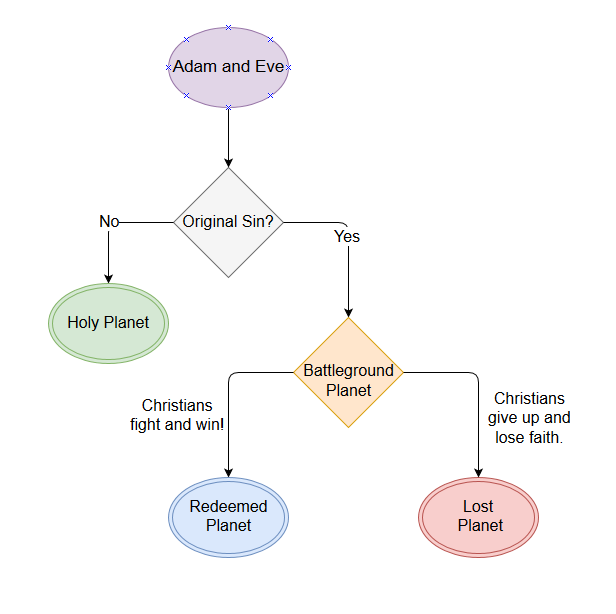 Our Adam and Eve fucked up and ate the forbidden fruit, giving evil a foothold in our world. But what if some of the A&Es hadn't fucked up? What if they maintained a pure relationship with God without fail? What would their worlds look like? This fascination of Christians with other planets is one of those "Christian Culture" things that exists outside of Biblical text. There is a lot of in-culture talk about how Mormons supposedly believe they start new planets after their earthly death as a sort of spiritual colonization plan for suitable planets. The LDS church denies this, but non-Mormons talk about it anyway, like how non-Scientologists talk about Xenu. The idea is generally ridiculed, but has still taken root in Christian scifi imagination. You start with Adam and Eve and then introduce a way for original sin to enter the world. If A&E triumph, then you have a Holy Planet: a planet that never severed its relationship with God and exists in a state of perfect unity with him. 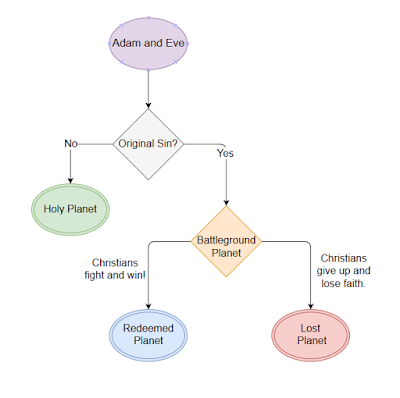 If A&E fail the test and original sin enters the world, you have a Battleground Planet: a planet with a tenuous connection to God and sin in its world. (Earth is in this category.) The call to arms is here: either Christians can fight! and win themselves a Redeemed Planet or they can lay down and and give up and Satan wins and we have a Lost Planet engulfed in sin and suffering, utterly cut off from God's love. All of this is why it was important to L'Engle to shoehorn in a reference to Genesis in the last chapter. Calvin, a virtual stranger to the family, put Charles to bed so that he could come back and tell Meg and Mrs Murry they were reading the Christian book which contains the origin story of original sin. Why? I contend that wasn't just characterization but was in fact a choice to set the stage for the places we will visit shortly: Holy/Redeemed Planets (Uriel, Ixchel), a Lost Planet (Camazotz), and a Battleground Planet (Earth). One more thing to be aware of as we go: In this genre of stories, God and Satan are generally seen in direct competition with each other. The battle isn't quite "whoever has the most planets wins", but there is an underlying theme of cosmic struggle where the number of planets on each side matters. This introduces adventure and competition into the mundanity of Christian life--which is something Fred Clark has talked about to great effect. Going to church and being a good person is boring, but being a soldier in a cosmic battle of good versus evil where every conversion counts towards the bottom line of redeeming your planet and solidly joining the ranks of Good is exciting! So let's pan back to Uriel, which is "the third planet of the star Malak" and aptly described in this worthy study guide (which I recommend in case my summaries are unclear in points) as "a planet that has overcome the darkness"--i.e., a redeemed planet that Earth might one day hope to be. Uriel: El/God is my light. Malak: Arabic form of "angel". Here is a good example of what I spoke on before when I said that Christian Universalism isn't inclusive so much as appropriative. L'Engle has thumbed through other religions and cultures for names to use, but recycling other peoples' names for angel, goddess, death, etc. in a blatantly Christian framework isn't respectful inclusion. Authors! Please do not do this thing! Thank you. Now back to the text. “Mrs Who, I wish you’d stop quoting!” Charles Wallace sounded very annoyed. “What about me?” Calvin asked. “The life of your father isn’t at stake,” Mrs Whatsit told him. This passage is interesting because it shows an awful lot of people talking about Meg without Meg actually speaking for herself or even being asked to speak. Charles says they scared Meg (which is true, though she seemed to bounce into acceptance astonishingly quickly) and Mrs Whatsit points out Meg is going to have a hard time reconciling their humor with the seriousness of the situation and, like, ya'll realize Meg is right there? And you're talking about her in front of her. That's just rude. To top it off, we get another passage about how Charles is the smartest ever and definitely smarter than Meg because he knows this is all far more than just the life of his father. Except it kind of isn't? Without getting too much into spoilers, what they are doing here doesn't do more than save their father's life. So there really isn't more "at stake" except in the sense of the Butterfly Ripple Effect that works in this universe to justify how everything the protagonists do is more meaningful than they realize. This is also a Thing in Christian Culture as a way of making the mundane more palatable. But I digress, so let's try this paragraph again. Starting over: This passage is about how Meg was scared but Charles wasn't; how Meg can't comprehend the scope of this adventure in the same way Charles can; nor can Meg reconcile humor with solemnity in the way that Charles the empath does. All said with warm affection and pride by an angel who is very clearly playing favorites. SPOILER: Charles will get in over his head later and Meg will save the day, so this plays into the continued fantasy of the overlooked girl being the True Hero, but wowsers we are digging that Overlooked Girl trope so deep we're about to tunnel through to Australia. I am not a fan. “Where are we now, and how did we get here?” Calvin asked. “This I’m supposed to believe?” Calvin asked indignantly. “Aas yyou llike,” Mrs Which said coldly. I think this is Meg talking (finally!) and I'm not sure how she thinks that teleportation to a strange planet via faster-than-light travel (except sorta-not-really, it... look, that's in the next chapter, just hang on) is less peculiar than "anything else that's happened" when all the other peculiar things happened as part of this particular peculiar thing. "It doesn't seem weird to be on another planet in light of the weirdness involved in teleporting to said planet" is just a very odd sentiment to me. I guess bonus points that Meg isn't the emotional one here and instead it's the boy Calvin, but she seems weirdly accepting for someone who has been previously characterized as a scrapper who refuses to automatically defer to authorities. I liked that about her! She fought boys and argued with principals and refused to bend herself into the meek submissive girl-shape the world demanded of her. So it's a wee bit jarring to see her being totally incurious about, meh, new planet. Sure. “Clear as mud,” Calvin said. Tesser, Meg thought. Could that have anything to do with Mother’s tesseract? Okay, here is an authorial nitpick because this needed better editing. It is natural, yes, for the flow of a conversation to be jagged in real life. The topic of Tessering was brought up, then Father was brought up, then the topic of Tessering, then the topic of Father again, and Tessering won't be touched on until the next chapter. Yes, humans talk like this. But it is much harder to follow in reading and, since Reality Is Unrealistic, readers tend to prefer characters to stay on one topic at a time. So, okay, shelve the topic of tessering for the moment. (Short version: They travel by wrinkling the spacetime continuum. There's the book title.) We're going to talk about Father. That is a fair priority and I am on board with it. There's a lot of suspense here that is heightened for the reader, and I think it works because most readers aren't going to think "wait, why don't they just say 'your father is being held captive on another planet and we're going to try to rescue him'?" but I must say that for readers who do think that like this is going to be a frustrating ride because we won't get there for awhile. We have theologies to get through! Mrs Who tells Meg she has to learn patience if she wants to help her father, and Mrs Whatsit suggests "Why don’t you three children wander around and Charles can explain things a little. You’re perfectly safe on Uriel." It is important to understand that the children are safe on Uriel because it is a Redeemed (Sinless) Planet, but I am now very hung up on why Charles is meant to be the one to explain when events in this chapter will show he doesn't know what is going on! What on earth is Charles supposed to know? Mrs Which raised her authoritative hand. “Sshoww themm,” she said to Mrs Whatsit, and at something in her voice Meg felt prickles of apprehension. “Now?” Mrs Whatsit asked, her creaky voice rising to a squeak. Whatever it was Mrs Which wanted them to see, it was something that made Mrs Whatsit uncomfortable, too. “Should—should I change?” Mrs Whatsit asked. [...] “Now, don’t be frightened, loves,” Mrs Whatsit said. Her plump little body began to shimmer, to quiver, to shift. The wild colors of her clothes became muted, whitened. The pudding-bag shape stretched, lengthened, merged. And suddenly before the children was a creature more beautiful than any Meg had even imagined, and the beauty lay in far more than the outward description. Outwardly Mrs Whatsit was surely no longer a Mrs Whatsit. She was a marble white body with powerful flanks, something like a horse but at the same time completely unlike a horse, for from the magnificently modeled back sprang a nobly formed torso, arms, and a head resembling a man’s, but a man with a perfection of dignity and virtue, an exaltation of joy such as Meg had never before seen. No, she thought, it’s not like a Greek centaur. Not in the least. From the shoulders slowly a pair of wings unfolded, wings made of rainbows, of light upon water, of poetry. Calvin fell to his knees. There is more theology here: Mrs Whatsit resembles a perfect angelic face ("a man with a perfection of dignity and virtue, an exaltation of joy") and Calvin falls prostrate in worship only to be picked up and gently admonished "not to me. never to me". Please understand that there is someone he should fall prostrate to, it just isn't Mrs Whatsit. This was perfectly clear to me, coming from the evangelical culture that I shared with L'Engle. “But what do we call you now?” Calvin asked. “Oh, my dears,” came the new voice, a rich voice with the warmth of a woodwind, the clarity of a trumpet, the mystery of an English horn. “You can’t go on changing my name each time I metamorphose. And I’ve had such pleasure being Mrs Whatsit I think you’d better keep to that.” She? he? it? smiled at them, and the radiance of the smile was as tangible as a soft breeze, as directly warming as the rays of the sun. They left the great granite plain and flew over a garden even more beautiful than anything in a dream. In it were gathered many of the creatures like the one Mrs Whatsit had become, some lying among the flowers, some swimming in a broad, crystal river that flowed through the garden, some flying in what Meg was sure must be a kind of dance, moving in and out above the trees. They were making music, music that came not only from their throats but from the movement of their great wings as well. “What are they singing?” Meg asked excitedly. “Don’t be lazy,” Charles said. 42 Behold my servant, whom I uphold; mine elect, in whom my soul delighteth; I have put my spirit upon him: he shall bring forth judgment to the Gentiles. I have bolded the bits that L'Engle used, and you'll note they are used word-for-word. Now, to be clear the totally-not-Greek centaur-pegasi flying around Uriel aren't actually singing Isaiah 42. This is a paraphrase, not a translation, from Charles Wallace. "Translation vs Paraphrase" is a big deal in the Christian community, because the Bible was not written in English. Every Bible you pick up to read in English is either a "translation" (i.e., in theory they stuck to as literal a meaning of the text as possible, although this is not quite true) or a "paraphrase" (i.e., they tried to stick to the spirit of the text and rendered it in ways modern readers would understand). The conflict is between the Letter of the Text vs. Spirit of the Text and the controversy is complicated because no translation is perfectly to the letter and every paraphrase is technically a 'translation' since the language is changing in the process--BUT the larger point here is that Christian audiences coming from an evangelical background will key to the idea of translation-vs-paraphrase very quickly. What Charles Wallace is doing here is paraphrasing: the centaurs are singing something he can't translate word-for-word, but the gist of the song is Isaiah 42. So while the alien creatures of Uriel aren't singing Isaiah 42 word-for-word, the gist is that they are. Everyone clear? Good. The planet isn't Christian in the sense that we mean it--they wouldn't understand the word 'Jesus', for example--but they are Christian in a parallel sense. They sing glory to the Lord in their own words and those words are similar to Christian words, even if they aren't the exact same. I do think Wrinkle in Time makes so much more sense if you have the Biblical answer-key handy. Because a lot of the things that happen in this book probably seem a bit random and weird until you realize that oooooooh she was working off a Biblical passage and so that's where that detail came from. This is one of the reasons why I, as a reader coming from an evangelical culture, didn't feel like the world-building was scattered or inconsistent because I had that contextual cheat sheet right there with me. Of course we would have a story about original sin after that name-drop of Genesis! Of course we would have various plot elements after the Isaiah framing! This was cultural knowledge that I had, the same way I know if there's a Newbury medal on the front of a book the dog will die. Throughout her entire body Meg felt a pulse of joy such as she had never known before. Calvin’s hand reached out; he did not clasp her hand in his; he moved his fingers so that they were barely touching hers, but joy flowed through them, back and forth between them, around them and about them and inside them. When Mrs Whatsit sighed it seemed completely incomprehensible that through this bliss could come the faintest whisper of doubt. Or in other words: Aslan-Mufasa shivers. Mrs Whatsit asks one of the centaurs to pick three flowers and she gives them to the children to hold on to them. Then she flies them high up into the planet's atmosphere and tells them to use the flowers to breathe. Meg felt Calvin’s arm circle her waist in a secure hold. Now they were in clouds. They could see nothing but drifting whiteness, and the moisture clung to them and condensed in icy droplets. As Meg shivered, Calvin’s grip tightened. In front of her Charles Wallace sat quietly. Once he turned just long enough to give her a swift glance of tenderness and concern. But Meg felt as each moment passed that he was growing farther and farther away, that he was becoming less and less her adored baby brother and more and more one with whatever kind of being Mrs Whatsit, Mrs Who, and Mrs Which in actuality were. Mrs Whatsit, Who, and Which are literal actual angels, so Charles is now officially a proto-angel. But I do like that we finally see a glance of tenderness and concern from him because I think this may be the first time he's been empathic at Meg in ways that show genuine adult-like sympathy and compassion and not just a normal little boy who likes his sister but doesn't understand enough not to affirm that she's hideous. Meg had almost forgotten the flowers, and was grateful to realize that she was still clasping them, that she hadn’t let them fall from her fingers. She pressed her face into the blossoms and breathed deeply. Calvin still held her with one arm, but he, too, held the flowers to his face. Charles Wallace moved the hand with the flowers slowly, almost as though he were in a dream. Mrs Whatsit’s wings strained against the thinness of the atmosphere. The summit was only a little way above them, and then they were there. Mrs Whatsit came to rest on a small plateau of smooth silvery rock. There ahead of them was a great white disk. “One of Uriel’s moons,” Mrs Whatsit told them, her mighty voice faintly breathless. The silver light from the enormous moon poured over them, blending with the golden quality of the day, flowing over the children, over Mrs Whatsit, over the mountain peak. “Now we will turn around,” Mrs Whatsit said, and at the quality of her voice, Meg was afraid again. Okay. Here we go. We're looking out into space and we're going to see the Black Thing which exists out in the space above Uriel but which does not engulf Uriel (as Uriel has been redeemed and is now perfectly safe and free of sin and they sing psalms all day). Meg’s eyes ached from the strain of looking and seeing nothing. Then, above the clouds which encircled the mountain, she seemed to see a shadow, a faint thing of darkness so far off that she was scarcely sure she was really seeing it. It was a shadow, nothing but a shadow. It was not even as tangible as a cloud. Was it cast by something? Or was it a Thing in itself? [...] It had not lessened or dispersed with the coming of night. And where the shadow was the stars were not visible. Meg’s hand holding the blossoms slowly dropped and it seemed as though a knife gashed through her lungs. She gasped, but there was no air for her to breathe. Darkness glazed her eyes and mind, but as she started to fall into unconsciousness her head dropped down into the flowers which she was still clutching; and as she inhaled the fragrance of their purity her mind and body revived, and she sat up again. The shadow was still there, dark and dreadful. Calvin held her hand strongly in his, but she felt neither strength nor reassurance in his touch. Beside her a tremor went through Charles Wallace, but he sat very still. He shouldn’t be seeing this, Meg thought. This is too much for so little a boy, no matter how different and extraordinary a little boy. And I... I don't know what kind of impact this would have on a non-evangelical child. (DO WE HAVE ANY HOME-GROWN HEATHENS IN THE AUDIENCE?) I understood quite quickly that the Black Thing was a specter of sin. It's a very common metaphor in Christian science fiction and fantasy, for something sinful to be shrouded in darkness or producing darkness. Frank Peretti used this often in his books later; I seem to recall that sinners in The Oath actually oozed slimy black tar from their chests when their sins built up too much to hide inside their hearts. So a cloud in space representing the reality of original sin in particular and sinfulness in general was honestly perfectly normal to me as a reader. Without that piece of information, I imagine this passage seems very odd? Like, there's a shadow in space and it's spoooooooky. There's no real description of the scariness of the thing, save that the children are very shaken. If you came at this from a scientific atheist background, would you immediately think 'dust cloud' and expect the children to investigate? Would the insta-evil vibe read as a little off after pages and pages of Science! and Ph.Ds! and Space Exploration! and Cape Canaveral? I DO NOT KNOW because alas I was an evangelical child rather than an atheist one. I would love to hear reactions in the comments. With a graceful gesture it dropped to the ground and folded its great wings. Charles Wallace was the first to slide off. “Mrs Who! Mrs Which!” he called, and there was an immediate quivering in the air. Mrs Who’s familiar glasses gleamed at them. Mrs Which appeared, too; but, as she had told the children, it was difficult for her to materialize completely, and though there was the robe and peaked hat, Meg could look through them to mountain and stars. She slid off Mrs Whatsit’s back and walked, rather unsteadily after the long ride, over to Mrs Which.